Learn how you can create your own personalized room accent using a fabric jelly roll! These cute rugs are perfect for the kitchen, for the bedroom or for your sewing room, and they make wonderful gifts. We will be using RJ Designs Jelly-Roll Rug Pattern to sew a miniature version of the rug. 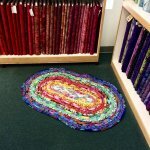 This mini rug will be constructed the same as the full-size rug, that way you can learn the technique before sewing the full rug. We will go over the construction from start to finish, share a few helpful tips, and talk about choosing fabrics and thread. Bring your machine, slide on table, regular sewing supplies and materials. Stop in to pick up a supply list and pattern.